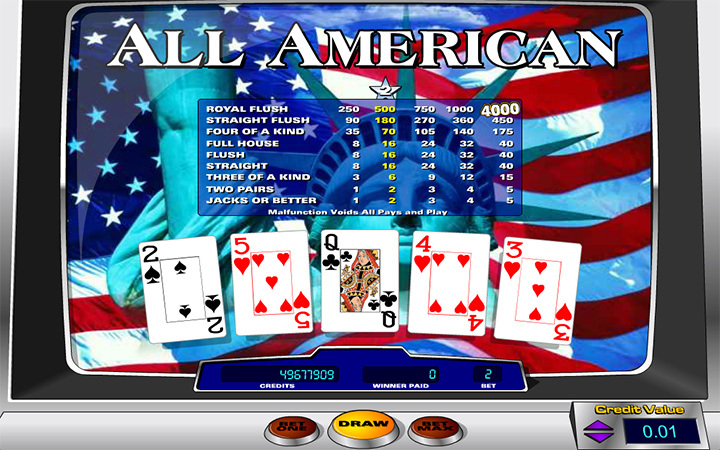 All American video poker game by Amaya Gaming is a “Jacks or Better” game. It has a modern interface when compared to other examples of the genre, but your goal is still the same: forming a winning poker hand. Jacks or Better games are more profitable than the usual poker, your winning odds and payouts are significantly higher. All American is a nice example of this rule, because it pays up to 4.000 coins at each spin. 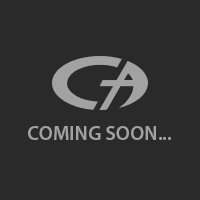 Take a look at the interface: it is clean, good looking and easily understandable. The paytable is at the top of the screen and shows the payout values of poker hands. To the middle, we have five poker cards. And at the bottom, there are buttons to control the game and to determine the wager. To start the game, press on the “deal” button. You will be given five cards, randomly. If you want to keep some of them, just press directly on the card. It will be marked with a “held” sign. (You can hold up to four cards.) Next, press on the “deal” button again. You will get new cards in exchange for the older ones, but your held cards will stay put. This is also the last dealing of that round, if you manage to form a winning hand, you will get paid according to the paytable. If not, try again! You’ll notice that there are two more buttons next to the “deal” button. To the left, there is a button named “bet one”. You can play All American game with 1 or 5 coins for each spin. You can set this value by using the “credit value” section to the right and if you click on the “bet one” button, each spin will exactly cost that value. “Bet Max” button allows you to play with the maximum values, which is 25 coins for each spin. We recommend always playing with 5 coins, to get the highest payouts. All American video poker game is nothing special or innovative. It is a Jacks or Better game with a modern interface. Payouts are good and the gameplay is fast – it does what it’s supposed to do. If you are looking for a Jacks or Better video poker game, take a look. Play at Casino Avenue for more casino games with the highest payouts!